I was just emailed this rather nifty word cloud that the Editors of Australian Archaeology have generated for a paper I have coming out in that journal later this year. It’s a great graphic depiction of what the paper is about: looking at possible patterns in radiocarbon dates on shell mounds for the Weipa region in Cape York Peninsula. If you’re not sure what shell mounds are, read this overview I wrote a few years ago. In short, they are cultural sites formed by generations of Aboriginal people collecting, cooking, eating and discarding shellfish—and other materials—resulting in the formation of mounds of shell. They are of high importance to Aboriginal custodians in the region today. Shell mounds at Weipa began to appear in the archaeological record just after around 3000 years ago, though I suspect ongoing research will eventually push this date back by another 1000 years. In this paper though, I wasn’t interested in the earliest dates. Instead, I was motivated by research elsewhere in northern Australia that suggested that Aboriginal people stopped constructing shell mounds around 700-500 years ago. The reason? Environmental changes are thought to have led to a drop in the availability of the main shellfish species found in shell mounds (Anadara granosa, known locally at Kwambuk). Does this theory apply at Weipa? 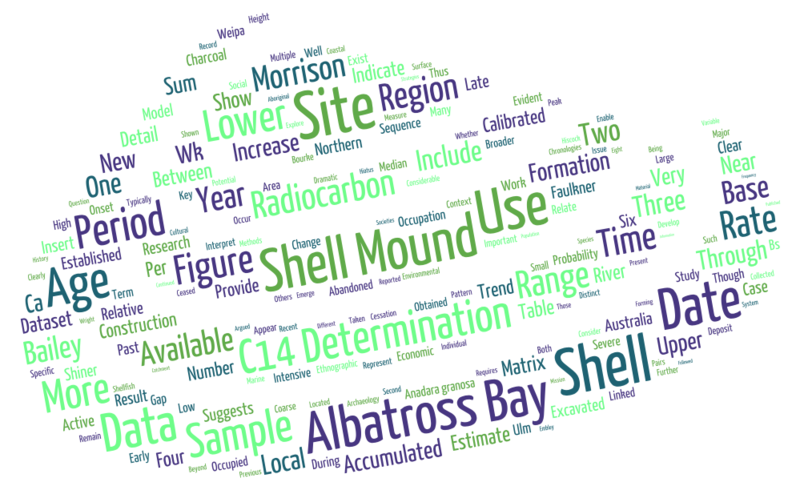 Close to 100 radiocarbon dates have been collected on shell mounds at Weipa, so I analysed this dataset to try to understand whether this theory could be supported. Without getting into the technical details, the answer was very simple. There is clear evidence that Aboriginal people continued to build shell mound sites up until AD 1800, that is, to within the past few hundred years. After that, our data is patchy because radiocarbon dating can not accurately date more recent samples. The other interesting result was that within the last 1000 years there seems to have been an increase in the rate of mound building, though this is a trend that requires more research to better understand. This issue is a focus of excavations planned next year at Weipa, i.e. to better understand patterns of mound use through the past 1000 years. You can find the abstract of the paper on the AAA website. If you want a copy of the paper, feel free to email me (or just join AAA! ).